The driving force behind the original Houston lodge was Walter Gunn, a professional Scouter from Beaumont. Mr. Gunn helped conduct the first OA ceremonies in the Houston area in 1928, upon an invitation from Marvin J. Paul. Both Paul and Gunn had worked together in the Beaumont Council and were members of the Neche Lodge #36, which was established under the leadership of Mr. Gunn. Paul had left Beaumont in 1925 to become Assistant Scout Executive of the Sam Houston Area Council, and was serving as Director Of Camp Masterson when he invited Walter Gunn to help organize the Houston lodge. Mr. Gunn became involved with the Order of the Arrow in 1921 at the Dan Beard Scout Camp where he was called out by Carroll Edson, Co-Founder of the OA. Carroll Edson also called out Gunn for the Vigil Honor in 1926. These experiences in his early years made Mr. Gunn an enthusiastic OA supporter. The original Houston lodge inducted many members, such as Saul B. Liebermann, who was the first new member. Bateman Hardcastle was elected as the Lodge Chief. Unfortunately, the program died out due to apparent hazing and a general failure to fulfill the purpose of the Order. Another attempt at starting a lodge was made in 1938. When L. S. Harkley, Scout Executive of the East Texas Area Council at Tyler, and his associates visited the Double Lake Camp in Houston, they discussed an Order of the Arrow program for Houston with Scout executive Jack Keith, and selected new members to form the lodge. Application for official charter was first made in 1938 and the Sam Houston Area Council was assigned #137. Marion King of Huntsville was chosen as the new Lodge Chief and the totem of the lodge was the Beaver. This time the program was eliminated due to a political clique which developed in the lodge. The third and lasting attempt to establish Colonneh Lodge began over a cup of coffee in a tent at Camp Hudson during the summer of 1945. Joining the Camp Director, Walter Gunn, were two adult staff members, Otto Love and Charley DuBois, and a boy, August Herbert. All were OA members who had moved to the Houston area. At this meeting plans were made to hold an OA Call Out and Induction that week and ceremonial parts were assigned. This marked the beginning of a successful Order of the Arrow program in the Sam Houston Area Council. During the week, the three adult Arrowmen talked with the Scoutmasters in camp about which of their boys were eligible for membership. These prospects were observed throughout the week by the four OA members, who then voted to determine which of them would be called out. August Hebert was then given the job of making six wreaths for the first group of candidates inducted into the Lodge. The Call Out took place at the Thursday evening campfire. Mr. DuBois played the part of Allowat Sakima, since he had the only elaborate Indian costume, and the other roles were played by Walter Gunn - Meteu, Otto Love - Nutiket, and August Hebert - Kichkinet. After the candidates were called out, they were sent back to their tents for a bedroll and knife and were blindfolded upon their return. They were then placed for their night alone where they were given two matches to burn their wreaths before going to sleep. The next morning, the candidates were served a piece of burnt toast and a cup of coffee and were given the honor of serving breakfast to the other campers. This was followed by the usual set of Ordeal projects with a lunch consisting of a tablespoon of beans, a slice of bread, and a glass of milk. After dinner, the candidates were again blindfolded and then participated in the Ordeal Ceremony. Such blindfolding was prevalent in the early days since it apparently assisted the ceremonial team in memorizing their parts. In a similar fashion, Ordeals were conducted throughout the summer of 1945, inducting a total of fifty new members. However, this was not the first attempt at organizing an Order of the Arrow lodge in Houston. Two other lodges had been previously formed which met with little success. After two failures at forming a Houston lodge, Walter Gunn finally succeeded at Camp Hudson in 1945. The formation of the Lodge was delayed by the Second World War, but the momentum for creating an OA program was supplied when Mr. Gunn resigned his job as Scout Executive in Beaumont and moved to the larger Sam Houston Area Council. Here he was asked by Paul L. Biesenherz, Central District Executive, to draw up plans to organize the Lodge with the strong backing of Council Scout Executive Jack J. Keith. The other Arrowman who came with Walter Gunn from Neche Lodge was August Hebert. August received his Eagle and was elected to the OA in 1942, but he fared poorly in his first experience with he Order. While working on his Ordeal projects, he cut himself and went to be treated with first aid. When asked what was wrong, he answered and was thrown out for talking. Life was hard in those days. Luckily August did better in 1943. After a Lodge business meeting in September of 1945 where August Hebert and Billy McRae were elected as Chief and Vice Chief respectively, the next Lodge function was the first induction of adults. Fourteen adults spent a cold and rainy weekend in October at the newly opened Camp Strake, then known only as Grand Lake. One of the candidates for induction was Claude Slaughter, who was the unit leader of E.A.S. #6. ?This unit was an Explorer outfit to which many of the original leaders belonged. Due to the boys' respect for Mr. Slaughter, they decided that he should have meat for lunch and so he was served the well-known copperhead sandwich complete with head and tail. Needless to say, Slaughter declined the honor. With the summer of 1946, both summer camp and the Order of the Arrow moved from Camp Hudson to Camp Strake which has been the Lodge's base of operations ever since. In 1947 it was the site of the first Brotherhood Ceremony where fourteen Colonneh Arrowmen sealed their membership in the Order. Assistance was given by Neche Lodge #36 in performing the ceremony. It is interesting to note that in those days there was no Brotherhood sash; one merely wore the Ordeal sash over the left shoulder to signify Brotherhood membership. Although the Lodge was named Colonneh from its beginning in 1945, no symbol or insignia was designed until 1947. That year Frank Holloway came up with the thunderbird emblem which represents a stylized raven. He carved and wrote this symbol all over Camp Strake to stimulate the Scouts' curiosity about the OA and because of this association with the camp, it was eventually adopted as the Strake symbol. (Note the differences between the Strake thunderbirds and the present-day Lodge symbol). The first Lodge activity besides inductions was the dance team organized in 1948. Their first performance was in Rosenburg and was viewed as a success by some and an interesting curiosity by others. When the team performed at the Infamous Scout Circus of 1949, they created a quite different impression. Many of the dancers wore only a breechcloth and unfortunately someone's belt broke, leaving him to dance in the Karankawa style. The '49 Fall Pow Wow featured two firsts for Colonneh - the Vigil Honor and the Lodge pocket flap. The Vigil Ceremony was held under the guidance of the Lodge's only Vigil member, Walter Gunn, and again relied up on the help of neighboring Neche Lodge #36 from Beaumont to conduct the ceremony. The first candidates for the Lodge's highest honor were Charley DuBois, Claude Slaughter, H. L. "Red" Sweet, and R. A. Wilson. The Pow Wow also brought to a close a period of growth and consolidation for the Lodge. Its next challenge was to expand its program outward to better serve the council's units. The decade of the 1950's was a period of firsts. During this time, the emphasis of the Lodge program shifted to council camp promotions. Previously the OA existed mainly to recognize honor campers and as such, its activities were basically confined to summer camp inductions. 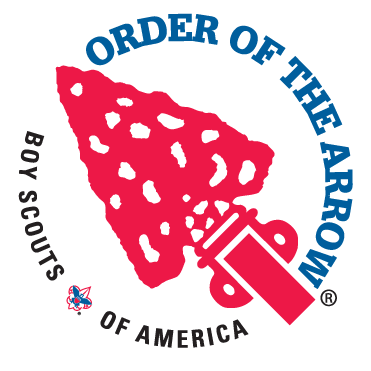 This was representative of many of the changes taking place in the Order of the Arrow nationally, such as restriction voting to those Lodge members under twenty-one and allowing for the election of boys to the Vigil Honor. Several "firsts" occurred during this period. As the Lodge's ceremonies grew better and larger, the need for a permanent ceremonial ring became evident. The ring was constructed in the summer of 1949 by Lodge Vice Chief elect Bud Williams with the help of Willard Artusy, Frank Holloway, Claude Slaughter, and Walter Gunn. A complete secret to all who were not members of the Order, the ring was located in what was Tall Timbers campsite #1 and now the Camp Strake Conference Center. A problem arose when the group was faced with three large stumps in the center of the ring after the site was cleared. One suggestion, which earned Mr. Gunn the nickname of "Dynamite Dan" was to use thirty sticks of dynamite to annihilate all of the stumps. Fortunately, they followed another suggestion and the ring survived until Tall Timbers was opened in 1958. One of the early developments in Colonneh Lodge was the annual Klanjo, which was held during the week between Christmas and New Year's. The Cherokee word Klanjo means "the gathering of the clan to stomp the ground". This fellowship was held at camp well into the 1960's, but its spirit is best typified in the words of the 1952 Chief Ed Hendricks as "Let's stomp, dance, and do service!" 1953 heralded the arrival of the first Lodge newsletter. Two years later, the paper still had no name but carried the descriptive phrase, "Published every now and then". Colonneh entered the troubled decade of the 1960's with a steadily growing program. One of the very active boy members during the period was Mike Callaway, who served as 1960 Area Chief and 1961 Lodge Chief. An unfortunate example of this period of American history, Mike was killed in Vietnam in 1967, which ended his ambition of becoming an professional Scouter. During the early sixties, the Lodge underwent few changes and carried on a steady program. In 1962 the Lodge Banquet moved from its original home at First Methodist to the newly completed conference facilities at camp Hudson. During these years, Virgil Smith was advising the Lodge, then he served as Chairman of the Southeast District for 1965 - 1966 and Otto Wendenburg became Lodge Advisor. James Olive was elected Chief for 1965 but was unable to complete his term due to unusual circumstances. Terry Robinson, who completed Olive's term, was elected Lodge Chief for 1966 at the Fall Pow Wow. Two significant changes occurred at this function: The Fall Ordeal was no longer held simultaneously and this was the first usage of a secret ballot in the Lodge elections. Prior to this time, a member registered his vote by standing in line behind his candidate. This practice obviously increased the peer pressure on members to vote for certain candidates. During Terry's year as Chief there were many changes in the Advisors. Virgil Smith had returned as Lodge Advisor late in 1965 and was joined in the next year by Quincy Lee and Dabney Kennedy. Mr. Lee was appointed Staff Advisor by Scout Executive R. E. "Chub" Byrnes who replaces Minor Huffman in 1965. The new Lodge Co-Advisor was Mr. Kennedy, who moved from Brownwood where he had served as Otena Lodge Chief from 1953 to 1956, Lodge Advisor, and as a key leader in the development of Area IXD. With the dynamic inputs from these four adults, Colonneh was setting a fast pace for the future. David Maddox, as 1967 Chief, presided over an active year for Colonneh. A new Lodge Constitution, was written by a committee headed by Maddox, went into effect in January of that year. It outlined the responsibilities of the Lodge officers and committees. David also served as 1st Vice Chief of the '67 Area Conference where Colonneh swept the awards, winning all the Dance Competition prized, the Dirty Dozen field sports relay, and the Most Outstanding Lodge Award. On the return trip from the '67 National Conference, David Maddox and Dabney Kennedy created two new Lodge programs - the Arrowman's Achievement Awards and the Lodge Clans. The AAA was designed to encourage each member to fulfill his obligations to himself, his unit, and his Lodge and at the same time assist Colonneh in proving that it was the best Lodge in the nation. The Lodge Clans were formed to encourage excellence in dancing and the performance of ceremonies. The Dance Clan emblem consists of a white arrow on a red sash worn from the belt, while the Ceremonial Clan utilized as white arrow on a black sash. Under the leadership of 1968 Chief Bob Wessels, Colonneh once again carried home the Outstanding Lodge Award from the Area Conference. Later in the year, the Lodge celebrated its "Fortieth Anniversary" at the Pow Wow under the misconception that Colonneh had begun in 1928. At the closing session, Walter Gunn was honored for his years of service and for founding Colonneh in 1945. More changes were in store for the Lodge in 1969. Lodge Chief Steve Taylor moved the Lodge Officers Training Conference from Camp Hudson to Houston Baptist University, where it has continued to be held with few exceptions for the next several years. In February of the same year, Staff Advisor Quincy Lee left Houston to become the Scout Executive for Conquistador Council in Roswell, New Mexico and was replaced by Sterly Dossmann. Dossmann, 1957 Lodge Chief of Aina Topa Hutsi (San Antonio), was a close friend of Dabney Kennedy, as they had worked closely together in Area IXD. One of Sterly's early additions to the Lodge program was Camp Work Weeks - one in June after school had ended, and the other in December between Christmas and New Year's. Serving as Area Staff Advisor, Sterly and the Area Chief Bob Wessels set a national precedent by taking the 1969 Area Conference out of camp and onto a university campus. Although held at Sam Houston Sate University, the atmosphere did not effect Colonneh's winning ways, as the Lodge won all the individual Indian Dance awards. Later that summer at the National Conference, Dabney Kennedy became the first Colonneh Arrowman to receive the Order of the Arrow Distinguished Service Award for his devotion and leadership through the past seventeen years in Otena, Colonneh, Area IXD and IXB, and at four National Conferences. The highlight of the Pow Wow was the resurrection of the Lodge Chief's bonnet. Made in the fifties, the bonnet disappeared from some years before being found by Bill DeLeon in the Camp Strake bone yard during the spring of 1969. That summer the bonnet, which consists of a set of perfectly matched eagle feathers, was completely rebuilt by Ken Patty, which helped earn his Vigil Honor name Gedalastula Gatlunska; meaning Bonnet Maker. The bonnet was presented to Chief Steve Taylor Friday night of the Pow Wow. The tremendous success of Colonneh Lodge in the past few years was expanded by 1970 Chief Harry Thomson. Like his predecessor David Maddox, Harry had chaired a committee to rewrite the Lodge Constitution and the new one went into effect in January of 1970. Many new and exciting programs were implemented of the original Lodge History, written by Harry Thomson and Vice Chief of Chapters Fred Crowder. The Area Conference held that summer was an exceptional function in many ways. first and foremost was the appearance of the OA Founder E. Urner Goodman. Other dignitaries included: Martin Mockford, past National OA Secretary, David Boshea, then National OA Secretary, and Ed Luckett, the National OA Committeeman from Fort Worth. Also at this Conference, newly appointed Area Advisor Dabney Kennedy was honored by the Area's creation of the Dabney Kennedy Service Award, which was given each year to the lodge rendering the most meaningful service to its council. Colonneh Lodge was selected as the first recipient of this award. Harry Thomson's completion of 1970 as Lodge Chief placed him fourth in a line of extraordinary Chiefs beginning with David Maddox. Along with exceptional Advisors and many dedicated Arrowmen, Colonneh had risen to become one of the most influential and best lodges in the nation. The 1970s period in Colonneh's history exhibited a less spectacular but nevertheless steady growth in the Lodge's program. Although gone were the days when 650 Arrowmen would attend a Pow Wow and the Lodge membership was 3000, Colonneh continued to provide quality service in the face of a national decline in enrollment. The presentation of the original Lodge History at the 1971 Lodge Banquet kicked off the new year for Chief Rust Hurst. The year's program was highlighted by the summer Area and National Conferences. OA Co-Founder Carroll A. Edson was the special guest at the Area meeting where Colonneh received the Dabney Kennedy Service Award and at the National Conference, former Lodge Chief Steve Taylor received the Order of the Arrow Distinguished Service Award. This Conference was also Dabney Kennedy's first opportunity to serve as a National OA Committeeman; a post to which he was appointed during this period. A sad note for the year was the promotion and departure of Scout Executive "Chub" Byrnes who was replaced by Ben Love. On their return from Philmont in the fall of '71, David Braun and Joe Kuti purchased a live raven for the bargain price of fifty cents and it was officially presented by Chief Braun to the Lodge at the 1972 Banquet. Unfortunately this Lodge mascot proved what a bargain it really was soon by expiring. Also at the Banquet, Joe put on display the E. Urner Goodman Camping Award which the Lodge received for worked done in 1971. The Spring Fellowship that year was the first to be held at El Rancho Cima and was presided over by newly appointed Lodge Chief Joe Kuti who took over for David Braun. The present system of Division Chiefs was approved along with a new Constitution in 1973 under the leadership of Chief Greg Barnhill. This replaced the four Vice Chiefs created in 1972 with four Division Chiefs and restored the single office of Vice Chief. That year's Pow Wow introduced the Lodge Brotherhood-Vigil Honor flap which was available as a one-per-life patch to Brotherhood members with an additional one offered to Vigil Honor members. This year also welcomed the arrival of Bill Corder as the new Scout Executive. The 1974 Banquet headed by Chief Larry Golemon was noted for its recognition of Bill Bianchi's tremendous effort in publishing the Lodge's first Camping and Canoeing Guidebook. The Section IIIA Conclave held at Lamar University featured Dr. Goodman as the special guest and saw Larry elected as Section Chief. Colonneh received the Dabney Kennedy Service Award at the Conclave as a result of Larry's successful Lodge Program. The major goal of 1975 Lodge Chief Bryan Euwer was the creation of living history program at Camp Strake. This involved construction of a log cabin at the camp which was begun in the winter of '75. Although considerable progress was made at that year's Winter Work Week, later Chiefs did not share Bryan's enthusiasm for the project, so it was later abandoned. Advisors for the year continued to be former Chief David Maddox as Lodge Advisor and Bob Warren as Staff Advisor. The '75 National Conference featured the introduction of the 60th Anniversary Bicentennial Award. The Bicentennial year of 1976 was an active one for Colonneh Lodge. After the Banquet held at St. Luke's United Methodist Church where Bryan Euwer attempted to pass the bonnet to lofty '76 Chief Steve Braun, the Lodge once again headed to the hills of El Rancho Cima for the Spring Fellowship. In April, the Lodge played an important role in the ill-fated Council Camporee by directing traffic, judging events, and participating in the Saturday Night Show which was later rained out. That summer, the lodge attended the first joint Section IIA - IIIB Conclave at Baylor University where Steve was elected Section Chief. Once again, Dr. Goodman attended as the Sections' special guest. Dabney Kennedy returned as Lodge Advisor in '76 and Ernest R. "Tommy" Thomas, Jr. replaced Bob Warren as Staff Advisor. The most lasting achievement of 1976 was the implementation of the Skills Discovery Camp. This program, developed by Steve Hardesty and Doug Frasher, provides a show and do example of basic Scout skills and is held at Camp Strake during the spring and fall. SDC has developed over the years as Colonneh's most valuable service to the council and as such has received national recognition. The 1976 Lodge Officers Training Conference became the first such conference to honor David L. Hinds. David, an active Lodge officer, was killed in a canoeing accident in October, 1969 and became the first Lodge member to be inducted into the Vigil Honor posthumously. The LOTC since then has been renamed the David Hinds Memorial Training Conference and is supported by funds from the Hinds family. A major goal of 1977 Chief Tom Reed was the revision of the Camping Guidebook. Along with Joe Satterfield and Mike Alexander, the book was completely rewritten and distributed in early 1978. During this year, the last of the approximately 1000 Brotherhood-Vigil Honor flaps were sold and the Arrowman's Achievement Award was discontinued. The Fall Pow Wow featured a revival by Tommy Thomas of the Order of the Fork - The Organization So Secret That Even Its Members Don't Know Its Purpose. From the early fifties, this silly spoof of the OA was a Colonneh tradition through the 1970's. As in 1968, 1978 again marked the "Fortieth Anniversary" of Colonneh Lodge. This time around, 1938 was correctly used as the Lodge's founding date. Without question, the high point of the past several years was the 1978 Lodge Pow Wow. Billed as a gigantic birthday party complete with a ninety-six piece cake, the Pow Wow was also a reunion for many former officers, advisors, and members. With approximately 400 Arrowmen in attendance including a rare appearance by Dr. E. Urner Goodman, the '78 Pow Wow was a tremendous success and a fitting endpoint for this chronicle of the 1970's.